Do you want to experience Copenhagen in the best and most traditional Danish sense? Then you should consider renting a bike. At Rentabike.dk you will one of the biggest selections of rental bikes, which is designed to suit your every need. All our bikes are of the best possible standard and our prices start from only 125.- per day which makes our prices some of the best in Copenhagen. Experience Copenhagen like a true Dane – by bike! Every year millions of tourists come to Copenhagen to experience its many unique sights, go shopping for Scandinavian fashion, as well as to try the very famous Danish way of life. And if you really want to get to know Copenhagen and understand the Danish culture, you should consider renting a bike. Danes love to ride their bikes everywhere! It is both a fast, easy, cheap way to get around a big city like Copenhagen. And it is also good for the environment, which the Danes cherish a lot. It therefore no wonder that Copenhagen has been voted the best city for cyclists on multiple occasions. Copenhagen is a large city which divided into several areas called Noerrebro, Oesterbro, Vesterbro and Frederiksberg as well as the City Centre. 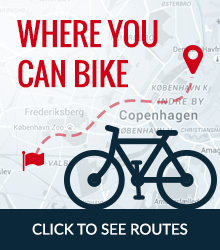 If you are a first-time visitor this can seem confusing however the Copenhagen bike cycle paths connects the entire city in a way that makes it both fast and easy to get around the city. It also gives you the opportunity to see Copenhagen from its most interesting and beautiful side. We would recommend you to download one the many free bicycle maps of Copenhagen before you arrive in Denmark. You can get your free map by clicking the link in the top of the page. The maps are sponsored by the City of Copenhagen. At the Rentabike.dk we proud to be able to present one of most extensive selections of rental bikes. IN our selections you find a wide range of different bikes that can be issued for many different things. In our selection you will both find practical city bikes as well as fast mountain bikes and of course the very popular Christiania bikes which is used by a lot of native Copenhageners every day. Lastly but not least we also have more unique bicycles such as tandem bikes which are very practical if you want to experience the city as a group. Besides many different types of bikes, we also have a large selection of bikes for children as well as all the necessary equipment such as bicycle helmets and much more. So, don’t worry about whether or not you have the right equipment, we do! Besides having one of the best selections of rental bikes in Copenhagen, we also have some of the best prices. At Rentabike.dk you can’t a bike for as little as 125 DKK per day, which makes our prices some of the best in the entire city. Our prices always include both a front and rear lights as well as a bicycle lock. We also rent out family bikes, Christiania bikes, tandem bikes, trailers etc. If you still have doubts about which type of bike that suits your needs the best, then don’t be afraid to contact us or to come by our physical shop. Our shop is located right next to Oesterport Train Station. You will find our entrance right next to track nr. 13.